Katy Carr is a Polish-British singer, musician, songwriter and aviator. A multi instrumentalist, she plays a vintage electric Wurlitzer piano, ukulele and banjolele. Born in Nottingham, England, to a Polish mother and a Scottish father, Katy Carr is a highly respected British artist whose music gets rave reviews in mainstream British media. Her third album “Coquette” was called “simply a masterpiece” and her music has brought her numerous awards. 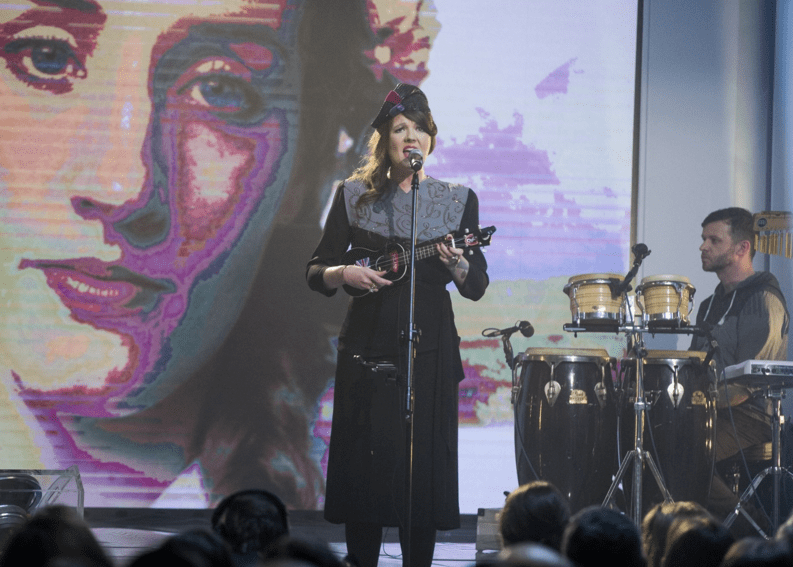 A singer with a haunting crystal voice, musician, multi instrumentalist, composer, songwriter and… aviator, she has released five albums, the last one titled Polonia, which is the Latin name for Poland. Katy Carr plays ukulele, banjolele and a vintage electric Wurlitzer piano. In fact, all about this unique artist is vintage – her looks, attire, and her passion – music inspired by history, mostly the history of Poland and its heroic fighters, also women, during WWII. Her knowledge of history is truly impressive and her music celebrates the heroes and events often unknown outside Poland, reaching audiences all over the world. Katy Carr has released five albums: Screwing Lies (2001), Passion Play (2003), Coquette (2009), Paszport (2012) and Polonia (2015). Her fourth album Paszport was released in Poland on 17 September 2012 (the 73rd anniversary of the Soviet attack o Poland) and on Madame Deluce Recordings in the United Kingdom on 11 November 2012. During her recent concert tour of Poland, she was awarded the Pro Patria Medal by the Ministry of Veterans and Victims of WWII in Lublin, Poland for her albums ‘Paszport’ and ‘Polonia’. There’s another aspect to Katy Carr’s music – education. The 2012 Kazik and the Kommander’s Car documentary film about Katy Carr’s meeting with Kazik Piechowski and his memories, inspired a project which encouraged over 60,000 British scouts to make a connection with Polish scout history. The Heart Poland – Building Bridges project reached over 2000 British school children. Katy Carr travelled to retirement homes across the UK to meet their residents and listen to tales of their war-time experiences and how music played a role in their lives.